​Female rapper Whitney Ca$h releases​ new music ​after a while with two new singles in the form of Bhejera and All Eyes On You. 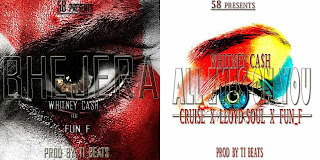 ​Both singles are produced by ​Ti Beats and feature Fun_f.​ ​All ​ ​Eyes On You has additional features by​ ​Lloyd Soul and ​Cruise. Bhejera ​is ​about being a sure bet that can counted on ​to ​deliver, anytime, every time. Whitney Cash states that she is a sure thing and can hold her own among the big dogs. Will you bet on Whitney? All Eyes ​On ​You ​talks about being the ride-or-die for the person you've always had your eye on.